I preached this past Sunday at the ordination service of Dana Olson, chaplain at Ingelside at Rock Creek. 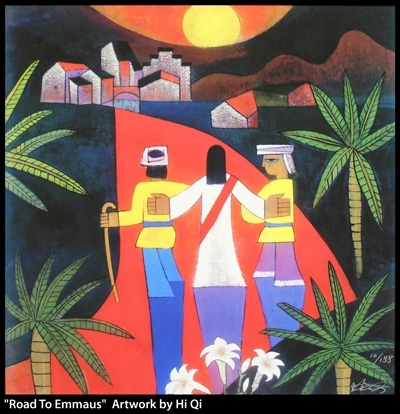 Dana picked the Road to Emmaus story as her ordination text. We are here today to ordain Dana Olson to the office of teaching elder in the PCUSA. We are here as the ordaining body, the Holy Spirit invoking community to lay hands on Dana and affirm her call to ordain ministry. Dana: child of God, beloved one of the font and companion of the table since a young one at Gethsemane Lutheran Church in Baldwin, Wisconsin. Dana, your call has gathered us, the priesthood of all believers, to bring you into the ordained life and to affirm, re-affirm, live into our own calls to disrupt the ways of injustice and be bearers of the Good News of Life. You have given us a gift to be gathered today. Thank you for your call and the way it’s building community right now in this very moment. And what a gift it has been for many of us to see your call, your courage, your confidence grow and multiply over the years. I’m thankful to be here on behalf of Church of the Pilgrims here in Washington, D.C. where you spent time as an intern while at Wesley Seminary. Today, it’s in the spirit of this story from the Gospel of Luke and the prophetic words of Micah, both whom give us stories of liberation and great reversals, that we ordain you, Dana, to linger and walk and accompany those on their own Emmaus Road walk of seeking Jesus in life and at table with companions. We meet the resurrected Jesus on the road to Emmaus, walking alongside Cleopas and his companion. We find Cleopas and his companion not just walking side-by-side with a stranger, but also walking side-by-side with grief and deep sadness. Just three days prior to this Emmaus encounter, Jesus had been crucified by the Roman Empire; put to death for the ways he shared life with the sick, the poor, the neglected, and despised. Jesus spent time with the oppressed and that time spent cost him his life. It’s important on your ordination day, Dana, to lift up not just that Jesus spent time with the poor and hungry. It’s important to name on your ordination day the quality of time that was spent between Jesus and the rejected ones of society. Throughout the Gospel of Luke we hear of stories of Jesus at table, sharing food and drink with companions. In fact, Jesus liked sharing meals so much that he was called a glutton and a drunkard. A companion is someone with whom we break bread. Companionship specifically, table companionship was part of life in Jesus’ time. And in the ancient world of Jesus, breaking bread took time. Jesus didn’t breeze through table fellowship like a McDonald’s drive thru meal or get a meal out of something like the ancient world’s equivalent of a vending machine in order to get to the next healing or miracle. While at table, Jesus lingered with his companions. They talked about pressing issues of the day, they discussed, pondered, wondered. They dreamed about a world made new. God turns the world upside down by exalting the humble and bringing down the mighty from their thrones, feeding the hungry, breaking the bows of the strong and giving strength to the weak. Jesus sat at table to explore what Micah’s words to act justly, love mercy and walk humbly with God meant in a world dominated by violence, greed, and poverty. While at table, Jesus lingered with extensive conversation over prolonged dinners. So how Jesus ate and drank with others is important because Jesus’ way of table fellowship embodied God’s great reversal. He gave strength to the weak, he fed the hungry while lingering. Jesus paused. He took his time at table. Being at table was were the stuff, the belovedness of life was centered for Jesus. Cleopas and his companion had to linger at table in order to recognize the Risen One. As Jesus did in his ministry, Cleopas and his companion sat and talked and shared with Jesus, they took their time to share their meal. In that time, in that sharing and talking, in the blessing and breaking of bread their eyes were opened to God’s greatest reversal of the resurrection. Dana: today we ordain you as a Teaching Elder. That’s a nifty, new title to have. And while today you will walk away with a new title, what you will walk away with as we ordain you is a life rooted in lingering. As chaplain here at Ingelside, you have been called by God to linger in the ways of Jesus. As you accompany this community in life, death, and all types of transitions, you are called to sit at table and linger with these companions, these breakers of the bread of Jesus. As you welcome new people to Ingelside, you are called to linger in that welcome. As Ingelside staff stop you in the hallway for brief conversation that turns into deep sharing, you are called to linger in the hallway. As you sit at bedside with the dying, you are called to linger in the dying process. At brunch here on Sundays at Ingelside, at dinner with residents on Thursdays, at any meal you share here at Ingelside, you, as their chaplain, Dana, as a Teaching Elder, you are called to sit, talk, dream, embody God’s great reversal while at table together. One of my dear mentor has always said, “justice is important, but supper is essential.” Our Emmaus story gives us this vision. Jesus had just been crucified by an angry mob and the Roman government. He could have sought retaliation. Jesus could have been walking to instigate a revolt, a violent protest to the Roman Ways of violence and persecution. He could have been walking to seek revenge on his own death. Instead. Jesus sat down with two strangers to share supper. While the structural changes necessary to subvert the Roman Empire ways of death weren’t immediately available, Jesus shared a meal and table companionship. The Roman Empire had the power to legislate laws but they couldn’t legislate radical love rooted in the table of Jesus Christ. There at table with strangers, Jesus shows us supper, a meal with others that lingers, is the source of love. We find the holy in what is ordinary, when we share what is ordinary in love—that’s the companionship that Jesus offers us, offers you, Dana, as a child of the font and table, as one who embraces your own belovedness, and one who see the beloved in others. Your call, your ordination, Dana, calls us to experience the sacraments in expressions beyond the enclosure of a traditional worship service. looking someone in the eye and asking, “how are you”, you are proclaiming and establishing Beloved Community here at Ingelside. We give thanks, Dana, to the churches in your life that have offered you this table fellowship, that have shown you God’s Holy Way. For Gethsemane Lutheran, for the Campus Christian Fellowship during your college years, Calvary Presbyterian here in Alexandria, for Saint Mark Episcopal during your Young Adult Volunteer Year in Guatemala, for Church of the Pilgrims. And thanks be to God these congregations have imaged their work on a lingering kind of God, a God that is relational and incarnational—a God that dwells in the deep places of us, our bodies, our neighborhoods, congregations and the web of life itself. Our God is one whose very nature is to be alongside those who suffer, in the transformation of life and death; a God who swirls inside of life and brings forth wholeness, great reversals and forms companions to break bread with one another. Dana: in your ordained life and ministry, we pray that the Church continues to call you to walk in the ways of accompaniment, of companionship. Just as Cleopas and his companion walked in a time of deep grief and loss, we pray the Church calls you to be that companion—that one who, with others, can tell the story of ancient Israel, one who proclaims the death and resurrection of Jesus, one who can tell the story of the women at the cross and tomb, one who can share of the vision of angels who said Jesus was alive. This is where I hope the spirit and story of Emmaus Road really takes hold of you, Dana. Our sacramental life in the reformed tradition, through the stories of faith, is at the font and the table. It’s where all of us, and particularly you now, live out our tradition of resistance. Dana, you know that we don’t have vending machine sacraments---we are called to spend time at the font and at the table. We are called to linger and spend time with each other. It is at the waters of baptism and at the table of bread and cup in our liturgy that as kings and empires fling and build themselves around us, we declare who we are and whose we are. We give witness at the font and table that it is from our brokenness that we do the work of the women of the tomb, we do the work of the angels, we walk in the ways of Cleopas and strangers, we do the work of following Jesus to the table. And when we get off course, because that’s what we do as humans, when, at times, we can’t recognize who is right next to us, when we get off course, God re-directs us, resurrects us back at the font and the table. With the stories of faith, the water of the font, the bread and the cup, you are part of God’s invitation to come back; be a new beginning as we learn over and over how to live and love again. In your ordination, you receive this sacramental work of our Reformed Tradition. This is a gift and the sacraments are powerful instruments and experiences for teaching and formation, for creating liturgy that is deeply committed to shaping and organizing prophetic, communal life. Your ordination, Dana, is also an act of accountability because we’ve seen throughout our tradition how the sacraments become a weapon in the hands of people more concerned with preserving power, authority, and privilege. You are called to share how Jesus has been made known to you and Ingelside in the breaking of the bread. Each time you come to the table, you do as Jesus did on the Emmaus Road: you take bread, you bless it, you break the bread and you share with everyone. It is our hope that at whatever table you break and bless bread, your eyes will be opened, again and again, and you will recognize that Christ is always at your table. In this life as a Teaching Elder, a minister of Word and Sacrament, Dana, release the waters of new life. Release the bead and the cup. Linger. Stay there. Be life. Act justly. Love mercy. Walk humbly with God, Dana. Trust that God is calling you to invite people to see how their life can become a sacrament—that’s when we share life, resist the ways of hurt and destruction. At the table and the font, we see means of hope, and heal from fear. From one ordained soul to another, welcome, Dana, to this new era of your life, your practice, your ministry, your life of lingering.